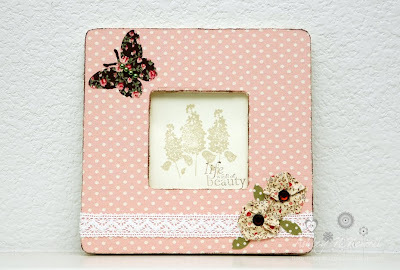 Here's a frame I made and posted on the Love My Tapes blog last week. All you have to do it peel the backing off the fabric sheet and place the frame on the fabric. Then trim off the excess, you can do this with ultra sharp scissors or a craft knife. I choose to ink the edges with some Memento ink to add a bit of age to this project. The butterfly was also cut from a fabric sheet, I just ran it through my Cuttlebug twice and it was able to die cut it then I added the pearls. I added our beautiful Lace Tape and then used our Lily Fabric Tape to make the flowers adding a gem in the center and free hand cut the leaves from our Jane Fabric Tape. In the middle of the frame, I put a stamped image and sentiment from Unity Stamp Co. I hope you enjoyed this project! Have a great day!